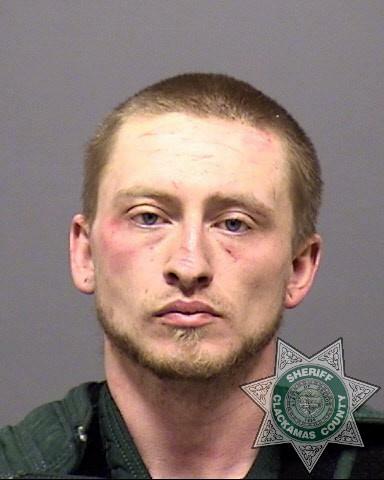 On Friday, January 11, 2019 at about 4:30 a.m., Nathanael Aaron Samuel -- 26, of Sandy -- was arrested in Camas, Washington, following a car chase in a stolen white Dodge pickup. At about 3:40 a.m., Oregon City Police Department officers located Mr. Samuel driving a reportedly stolen 2001 white Dodge pickup northbound on I-205 near Highway 213. OCPD officers, along with deputies from the Clackamas County Sheriff’s Office, attempted to stop Mr. Samuel in the stolen vehicle. When the attempt was made, Mr. Samuel accelerated at a high rate of speed in an attempt to elude law enforcement. Patrol vehicles pursued. The high-speed chase crossed the Glenn L. Jackson Memorial Bridge in to the State of Washington. After successfully deploying spike strips to flatten the tires to the vehicle driven by Mr. Samuel, the suspect crashed the truck and then fled on foot into Camas Cemetery, where he was apprehended by a Clackamas County deputy. Mr. Samuel is the suspect in numerous felonious crimes in Clackamas County. Investigators are investigating those crimes and are urging anyone with information in regards to this case or any other cases involving Mr. Samuel to contact the Sheriff’s Office Tip Line -- by phone at 503-723-4949 or by using the online email form at https://web3.clackamas.us/contact/tip.jsp. Please reference CCSO Case # 19-000835. A booking photo is linked above.